We had a great turnout for the YouthSource Center Grand Opening and CRCD Family Resource Fair that was held at 1006 E. 28th Street, Los Angeles, CA 90011 on September 23, 2017 from 11:00 am to 3:00 pm. The street was closed off while CRCD hosted a Family Resource Fair with music, free food, free flu shots, free child identification kits, access to many free services, and much more! We appreciate your support in helping to spread the word about the event, the free resource fair and our block party celebration! Congrats to our All Peoples Basketball Team that came in 2nd place in the Basketball Tournament! All Peoples Community Center is a proud partner of the new YouthSource Center and will now be offering new Youth Services at the Center. For more info on Youth Programs offered, please contact (213) 747-6357 Adrian Rios ext 151 or Michelle Watson ext 120. Congrats to all Graduates of our 10-week parenting course, and a special Thank You to Education Outreach Institute Instructors Marc Ahumada and James Thomas! Congrats Graduates! To sign up for our next Parenting Classes, please contact Laura Ramirez at (213) 747-6357 ext 119. How would you describe All Peoples Community Center: All Peoples is more than just a community center it is a second home to everyone. Favorite Part of Your Job: Being able to share the knowledge that I’ve gained as a first generation college student with the youth and their parents (e.g. filling out CSU/UC apps, FAFSA/ CA Dream Act, writing prompts, financial literacy, etc.). 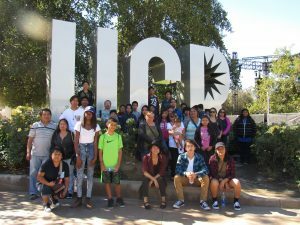 My best All Peoples story: We had taken a group of students and parents to LATTC’s Cash for College Event. They all had the chance to attend various workshops and got their questions answered. Towards the end, there was a raffle for a scholarship. 10 student attendees had the chance to win. They had just announced the 10th winner and unfortunately none of our students were called. Both the parents and students wanted to leave but I kept insisting, “wait… just give it a few more secs… just wait.” They called the student for the 3rd time and no show. One of the hosts pulled out another ticket and bamm… one of our students from All Peoples was the 10th winner of the scholarship. Hobbies: I like to play soccer, draw every now and then, write music, and stay involved in my community. We’re so happy that David Solis is part of our All Peoples Family!